Say you have an old desktop that used to run XP. You don’t really want to spend the money to replace it, but you don’t want it gathering dust either. Bottom line, you don’t want to spend any money right now and you’re willing to try something new and radical, yet safe and familiar. Never heard of it? Well, you’ve probably heard of Ubuntu. Zorin’s a flavor of linux with Ubuntu as its starting point. Zorin’s mission is to provide a Windows like experience for people who are new to Linux. Be warned, it is still Linux. There will be a learning curve, but you can do it! First off a word about versions. The version I’m recommending you install is Zorin 6.4 Core LTS (0r 6.2 Lite LTS if your machine is really ancient). LTS stands for “long term support” which in the Ubuntu Linux world means 5 years. 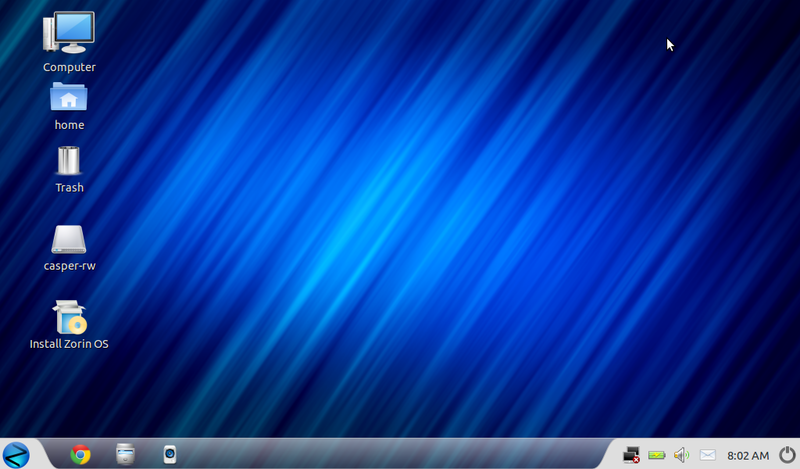 Zorin 6.4 is the latest LTS available, based off Ubuntu’s 12.04 LTS. It’ll be good for about another three years, and then you’ll probably need to do another install. You can try something newer but support times are shrinking. They used to be 18 months and now they’re 9 months. So this OS should last you 2-4 times as long as any other option besides spending money. *Clarification on support. Zorin 6.2 and 7.1 lite are no longer supported, but there is no version of lite for version 8 of Zorin (the latest). The 6.4 Core has the longest support of 2017. 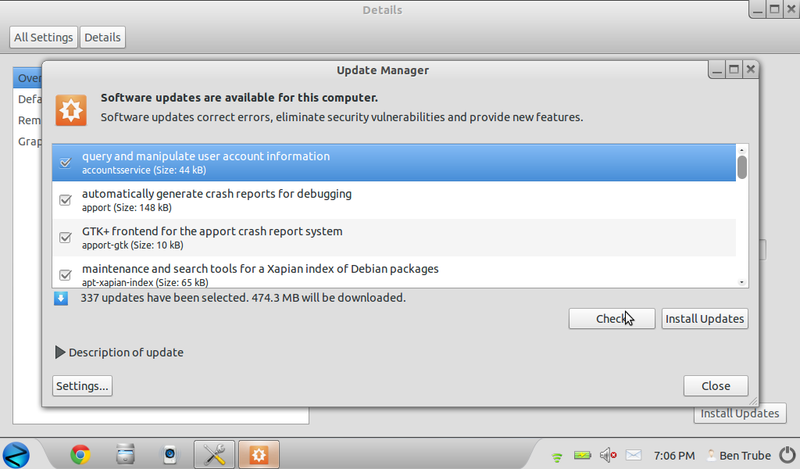 The reason for this is that Lite version is based on Lubuntu (lightweight Ubuntu) which has a different support cycle. I recommend using Core if your system can handle it, and the latest lite if not until a new version is released. (This differs from the version of Zorin I originally recommended for download, I am correcting the original post). 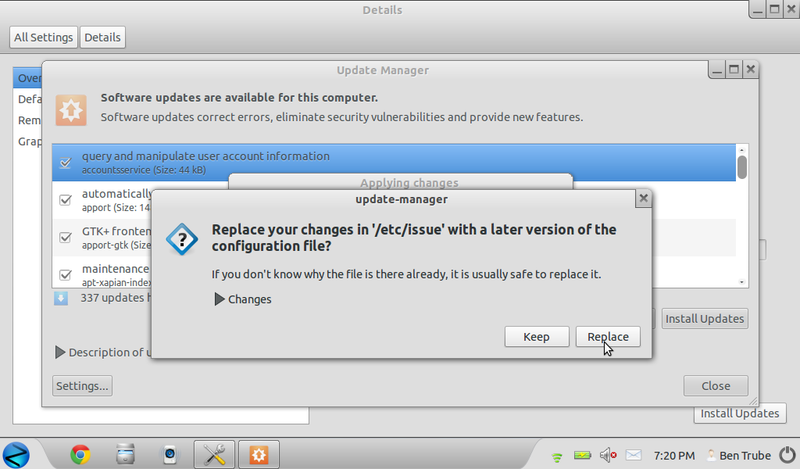 A new LTS version of Ubuntu should be released sometime this month, but when that update affects Zorin is unknown. Burning a CD or DVD from an ISO is pretty easy. If you don’t have the software on your computer, try InfraRecorder. If you don’t have an optical drive (external or built-in), then flash is really the only way to go. But not all BIOS’s support booting from a USB (more on this later). 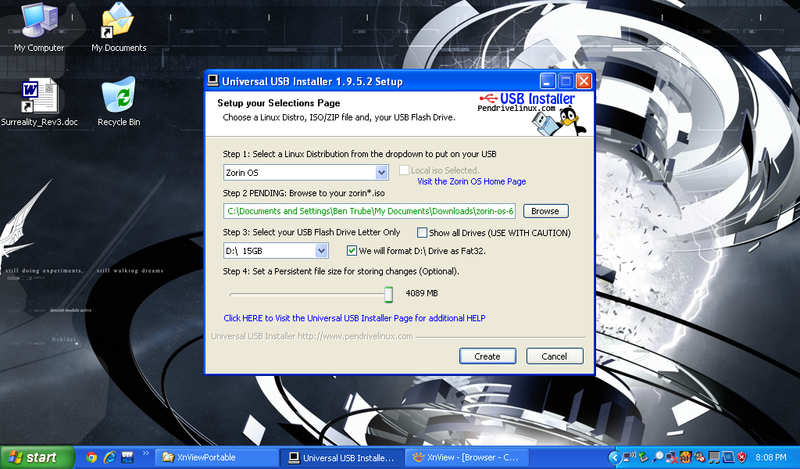 Using a USB allows you to create a full linux live system with persistent files that you can boot on any machine (in other words kind of like a virtual machine). But the data files are unencrypted and lost if you lose the USB. USB will be faster, but DVD will be easier and will auto-eject when finished installing. My suggestion is create both options (flash drive and CD/DVD) and try both to see which works. Flash drives can always be reformatted and CD/DVDs are cheap. Plus you have a backup of the OS if you ever want it. Assuming you’ve already burned a live disc, we’ll now create a live USB. Pendrivelinux’s UUI has some pretty simple to follow instructions. Select the Linux OS you’re installing from a drop down list (Zorin OS is under “other”). Browse to the location of your ISO. Select your flash drive (and optionally format it). The persistent file size is the area of your drive used to store any files or settings you create while running the live system. This makes it easy for you to try what you like, and then install everything you’ve changed without having to repeat it. If you’ve got a big flash drive, go ahead and slide this bar all the way to the end. Click create. Be patient, this could take as much as a half an hour to complete, but probably more like 15 minutes. Get a coffee. Send some e-mail. At some point it will start extracting the ISO image. This will pop up another window and will probably be one of the longer parts of the creation. The only disadvantage to the persistent drive it takes a few minutes to create. The program has to create a virtual drive that’s formatted correctly. If the program doesn’t look like it’s doing anything, trust me, it is. Some people prefer UNetbootin. Both work, there’s no real advantage to either. Use whichever you prefer. Your BIOS is what actually runs first whenever you turn on a machine. Modern computers hide the BIOS so you don’t even see that it’s working, you just see Windows. But trust me it’s there. They’re all a little different, and you even hit different keys to get to them. You’ll have to look up which one works for your computer but good candidates are F2, F9, F10, F11 and F12. My older ASUS netbook (model eee 1005 HA), used F2. You’re looking for a tab marked Boot settings or something like it. You probably will only be able to use your keyboard to move around. On the ASUS there are two boot orders, one marked “Boot Device Priority” and the other marked “Hard Disk Drives”. Make sure to have your USB plugged in when you are making these changes. Make “Removable dev” your first boot priority, and make the USB the first of the two hard drives. This setting doesn’t seem to hold if you remove the drive or even shut the computer all the way off. Most BIOS have CDs as the first priority item. You can leave this and make USB the second to cover all bases. If you’re successful you should see UUI’s load screen and then the Zorin live system will boot. There’s an icon on the desktop that might just be how we install this OS. It’s called “Install Zorin OS”. Before you click it, click on the network icon in the bottom right and connect to your internet connection. Make sure your device is plugged in. This install may take about an hour. Feel free to play around with the menu, or any of the buttons at this point. Familiarize yourself with the programs that come pre-installed. Everything’s organized by category so it should be pretty easy to find what you want. You can do one of a few things at this point. 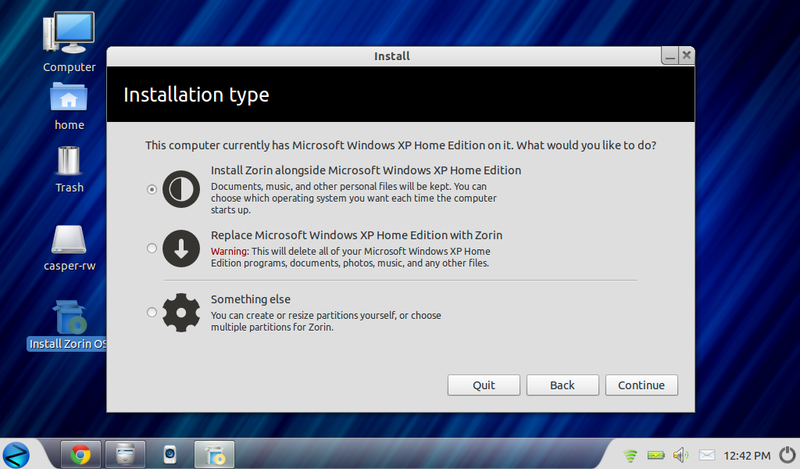 The first option is to install Zorin alongside the existing operating system. If you think you’re going to need XP in the future, just to run some programs you can’t get running anywhere else, go ahead and choose this option (I did). Note: XP demanded a chkdsk after I finished installing Zorin (probably because of the repartitioning). This is normal and XP should run fine after it finishes the check. If you think you’re ready to only live with Linux, go ahead and pick option two. Be aware this erases all your files and programs so hopefully you made a backup? If not, quit and try again. On the left is your old OS (assuming you kept it), on the right, Zorin’s new home. 40GB is a pretty good size though you can always go bigger depending on your needs. Just click and drag the bar in the middle to manipulate. 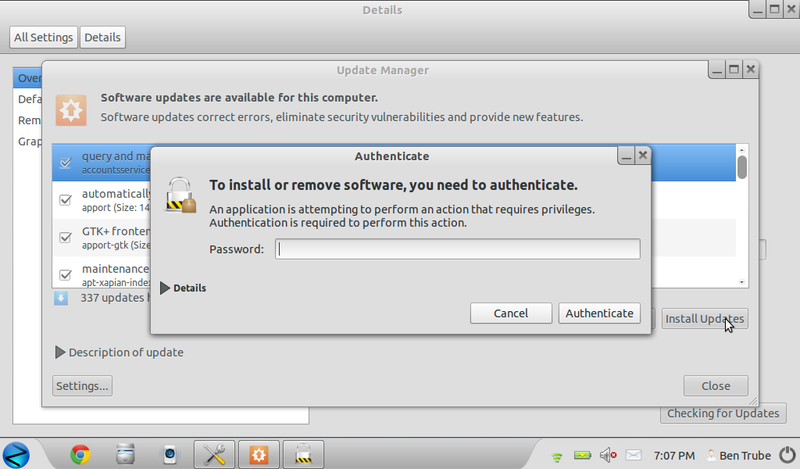 Note: Ubuntu does not define a GB in this case as a true gigabyte. It is instead 1,000,000,000 bytes. A real gigabyte is 1,073,741,824 bytes. So our 40 “GB” drive is actually about 38.4 gigabytes, still more than sufficient. Partitioning the drive for your installation will probably take a while, especially if your hard drive is really full and hasn’t been defragged in a while. When true installation begins there will be a few screens for determining time zone, keyboard layout, and login credentials. Once you’re done, Zorin may show you a video while it finishes copying all the files over. Note: Your user icon can be difficult to change after installation so make sure you pick one you’re going to like (especially if you take a picture of yourself 🙂 ). If you’ve plugged in a flash drive to install the OS you may want to choose to continue playing with the live so you can do a full shutdown rather than just a restart. Otherwise you might boot back up into the live system instead of the one you just installed. The shutdown icon in the bottom left will have a menu option that says either “System Up To Date” or “Check For Updates”. Click this either way, and then click “check” on the screen that comes up. Get used to doing this, this is linux’s user account control. “If you don’t know why the file is there already, it is usually safe to replace it”. Not a great habit, but seems okay in this case. Click on the internet category and use Zorin’s internet manager to install the browser of your choice. Click on the system group to change the look and feel of zorin. Take screenshots and see them auto appear in your pictures folder. Try to use WINE to install a windows program (more on this another time). This primer should get you started at least. Feel free to leave any questions in the comments, or show me something cool you’ve done with Zorin. Disclaimer: Any advice or tips given here will not be valid for all users in all circumstances. Do what makes sense to you and don’t do what doesn’t make sense. These posts are for educational, informative purposes only. Show these posts to your computer friends and have them tell you if I’m right on the money or out to lunch. In any case, please realize that anything you do to your computer is your responsibility. If you have a specific problem and need help, shoot me a comment, but if your computer bricks you were warned.